Today, 31 July 2015, I retired from Federal Service after 12 1/2 years of working as a Quality Assurance Specialist, Ammunition Surveillance/Explosives Safety Specialist. My retirement will be short lived because I start work on Monday at Spartan College of Aeronautics and Technology. I will be an instructor teaching Non-Destructive Testing and Quality Assurance. I will probably be taking a few classes too; I want to learn more about building and flying drones. I have chosen the Tulsa, OK area as my home. After so much travel these last 12 years, staying in one place for awhile sounds pretty good. My son Ed is a high school counselor in Tulsa, his oldest son is at school at OSU and his youngest son Leo will be a 3rd grader this year. My daughter Amy is a Mental Health Therapist/PACT Team director and has her son Elliot starting 3rd grade this year; they live in Edmond. Having everyone in one state is a real feat for our family, so life is good! Hope all of you have a wonderful time at the reunion. Denise Rutledge Batchelor has a birthday today. Denise Rutledge Batchelor has left an In Memory comment for her Profile. My memories of Louise are that of someone who had no limits to who she would befriend. She was always so nice to me and I really appreciated that; I had some rough times in High School, but she never failed to smile and have something nice to say. When I first joined this group, I saw her there and again she just acted like the years melted away and was so welcoming to me. Then we discovered that we both had a bond, one that no one else would even want to talk about, we had both lost children. It always helps to be able to talk to someone who has been through the same tragedy. She was always gracious, with a beautiful spirit. I know she will be missed by her family and friends and by me. 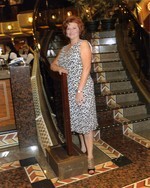 Denise Rutledge Batchelor updated her profile. View.